Learn more. Learn faster. Have more fun. 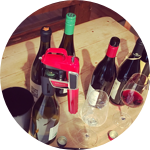 The Wine Guru specialises in personalised wine experiences and wine education to make you feel more comfortable, confident and independent around wine. I dedicate my time, knowledge and energy to you, and only you. Your time, your pace, your place. The only way to really transform your wine life. I will make sure you learn how to appreciate different qualities of wines, and expertly navigate that very moment a glass is poured in front of you. Power to you. The wine drinker. Discover the main reasons affecting the value, quality and style of wines, so you make the best “informed” decision about wines at every wine buying occasion, without relying on the bottle price as a guide. Power to you. The wine buyer. Immerse yourself in a journey of wine discovery that takes you from the basics of tasting wine, to understanding clearly about nature, production, grape varieties and the key wine growing regions of the world. Power to you. The wine explorer. Each package has been created to increase your understanding, acquire key knowledge and enhance your appreciation for wine. I want you to feel more comfortable, confident and independent around wine. Courses combine bespoke education material, videos & wines with one-to-one sessions at home. How many of these drinkers will be happy with their wine choices? Will you? Select which of the options you want to find out more about and apply to book your course. Places are limited. Invite your friend, partner or colleague to learn with you! Final tasting of wines with faults. Never doubt again if a bottle of wine is corked or not! We meet face to face to start the journey. Glass of wine on me! One day - 8 hours teaching. Wine tasting of key grape varieties. How to read labels and more. Invite your friends, partner or colleagues to learn with you! Final field trip shopping for wines together! We meet face to face to start the journey and tailor-made your wine education experience. Glass of Champagne on me! Two days - 16 hours teaching. Wine tasting, key grape varieties, key wine regions of the world & and all those missing pieces of the wine puzzle you always wanted to learn.